Ed and I try and fit in a date night as often as possible. With busy work lives and two young children added to the mix it isn’t always easy to have the quality time together all couples need. My mum, as I’ve mentioned, looks after the kids to help out, which allows for us to fit in some couple time together. So last night, we went on a rather impromptu date night. Whilst at work, Ed text me and told me he had booked a table at The Ox in Ashley Cross. Neither of us had eaten in there before so we didn’t know what to expect. We arrived a bit earlier than our table was booked for so had a drink at the, rather crowded, bar (Friday nights in Ashley Cross do tend to get fairly busy). 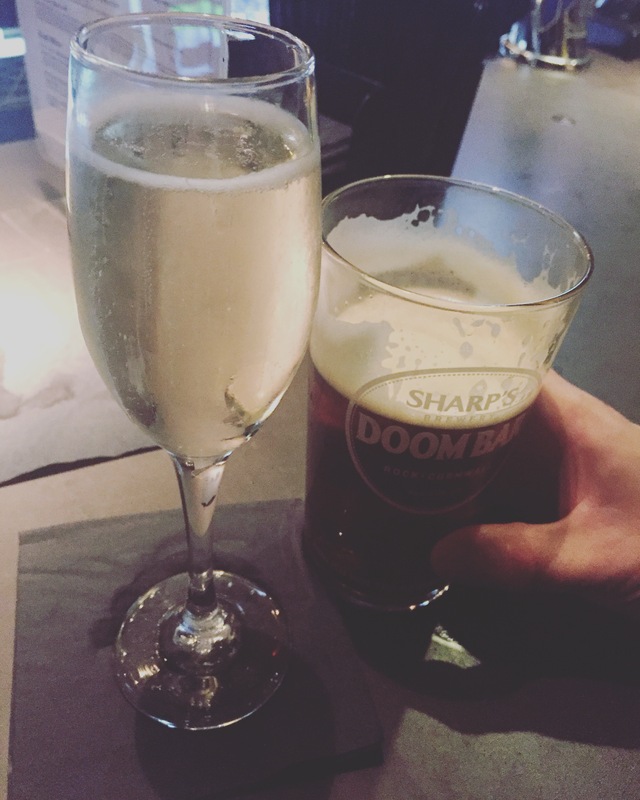 I had Prosecco, of course, and Ed had a pint of something I’m not even going to pretend to know what it was. After a slight confusion where we think they may not have actually had our booking, we were seated at a table set for four, with the other two place settings quickly taken away. Still, I prefer to sit at a table meant for two as I did feel Ed and I were quite far apart from each other, which does kind of ruin the romance of the date night. I assume the table was for four because our booking wasn’t taken down. Staff were very attentive and we were served quickly by 3 different staff members in total. Ed ordered us a bottle of Sauvignon to share, and he was offered to try first, which he declined, but that’s always a nice touch. We were also provided with chilled bottled water, without asking, which was again a nice touch. We ordered starters and mains, and then added an appetiser to our order as well- we were pretty hungry and feeling greedy. 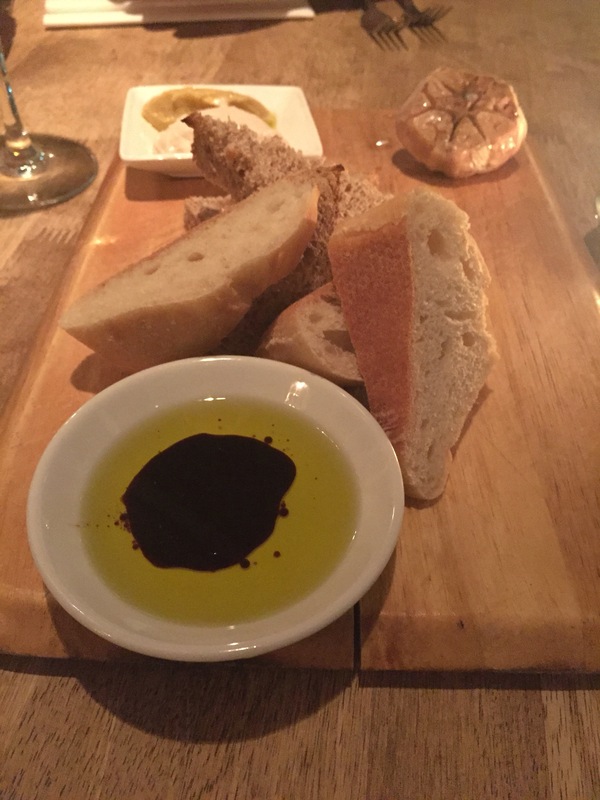 The appetiser came quickly- we had gone for artisan bread with olive oil and balsamic vinegar, garlic and some dips. It was a nice starter for our starters, although I regretted it a little when I remembered I also had bread with my soup and a burger in a bun for my main – carb overload! Our empty appetiser plate was soon replaced by our starters. 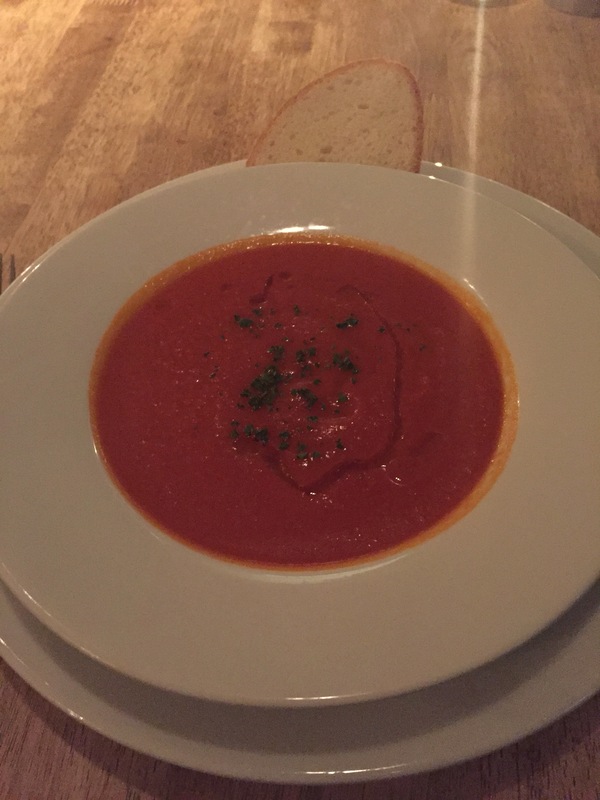 Mine was soup of the day – a tomato and red pepper, which was a little spicy, how I like it, and really delicious. Ed had gone for lambs kidneys, which I would never in a million years want to eat (he did try and get me to but I refused). It did look well presented and he said it was nice, I’ll take his word for it. For our mains, I had gone for a burger with both bacon and cheese added to the mix. 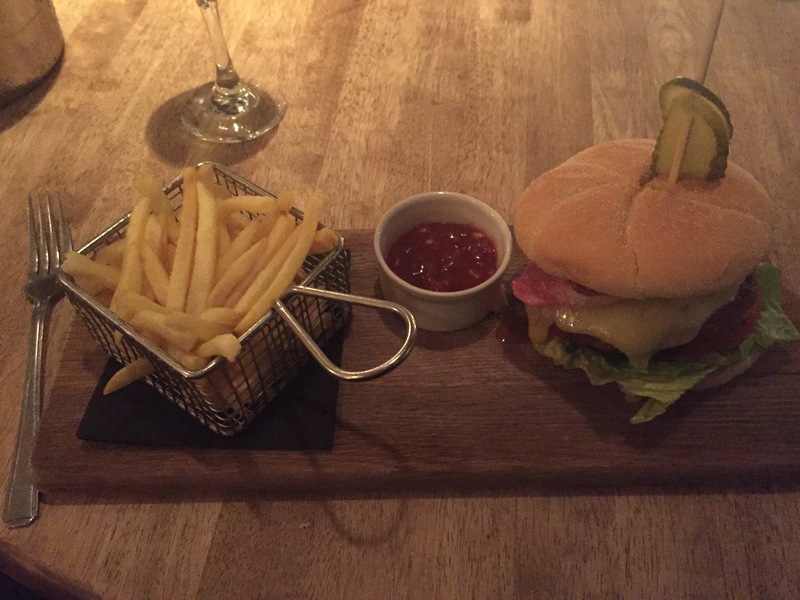 It came with chips, which were served in a mini frying tray, and burger relish. I couldn’t eat it all, possibly because of my previous greed on the other courses, but what I did eat was tasty. The burger was cooked with chorizo, which gave it a nice edge to its flavour. I’m not a huge fan of chips usually, and would have gone for sweet pototo fries (which were an option on the menu) but I fancied a change and these were nice. 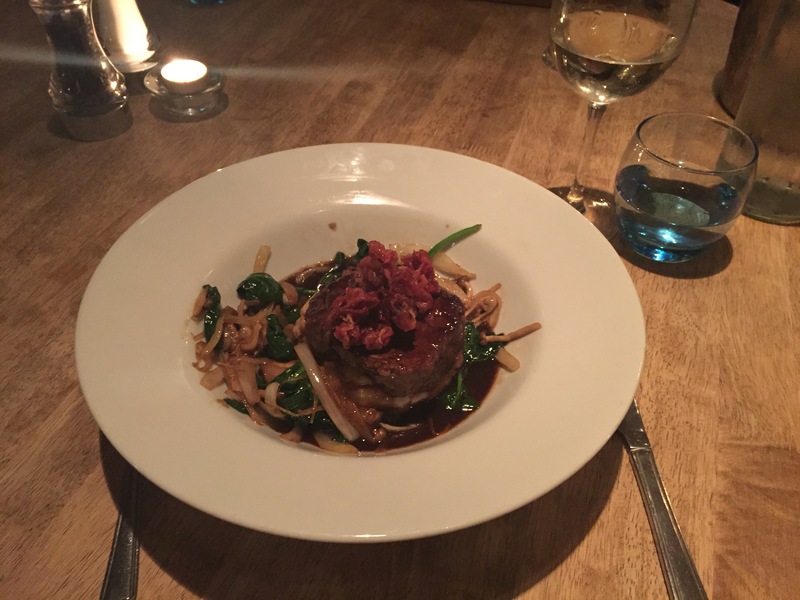 Ed had a fillet steak, which he thought was pretty good, and cooked well (medium, rare). We were given a dessert menu and I debated having the New Forest ice creams, but in the end decided against it as I was so full. 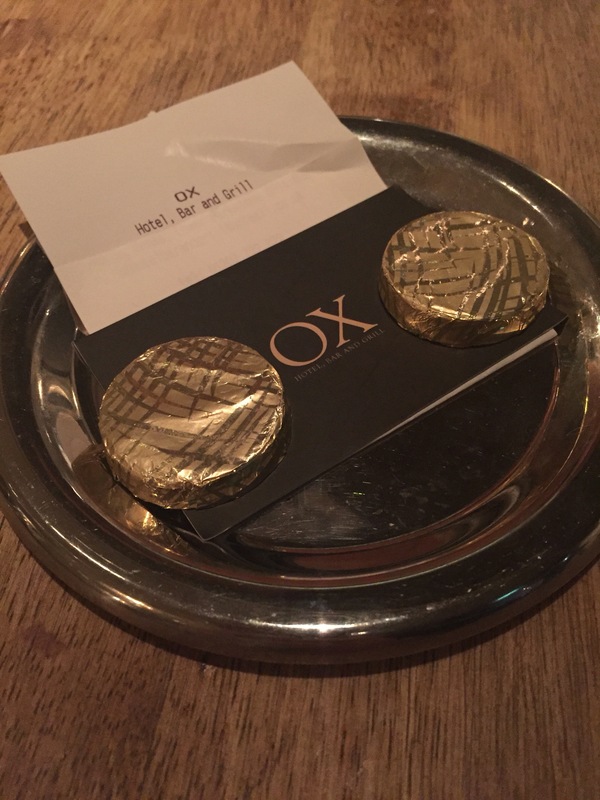 Instead we got the bill, which was more expensive than we would normally pay for a meal, but we found was justified by the quality, presentation and service we had experienced. 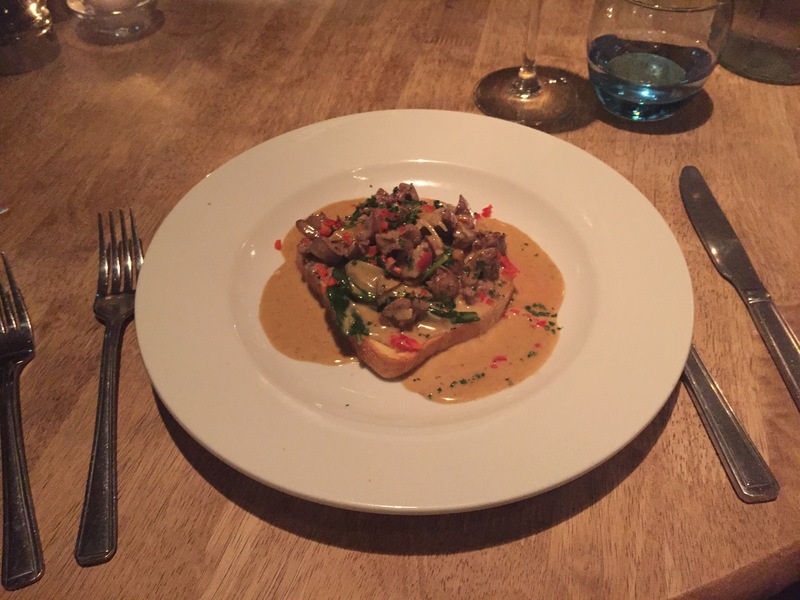 It was an enjoyable evening, with a relaxed, warm and welcoming vibe to the restaurant, which is set back from the busy bar, which takes the noise levels down. I think we would go again, but perhaps more for special occasions than a regular treat, as the prices were a little steep for our (very) modest salaries. I would definitely recommend a visit. Following our meal, we stopped off at a newsagents where the wine had clouded my common sense a little (who am I kidding, this is a regular occurance, I live for spontaneous bad decisions). I got a packet of rolos, a packet of nick nacks (remember those?) 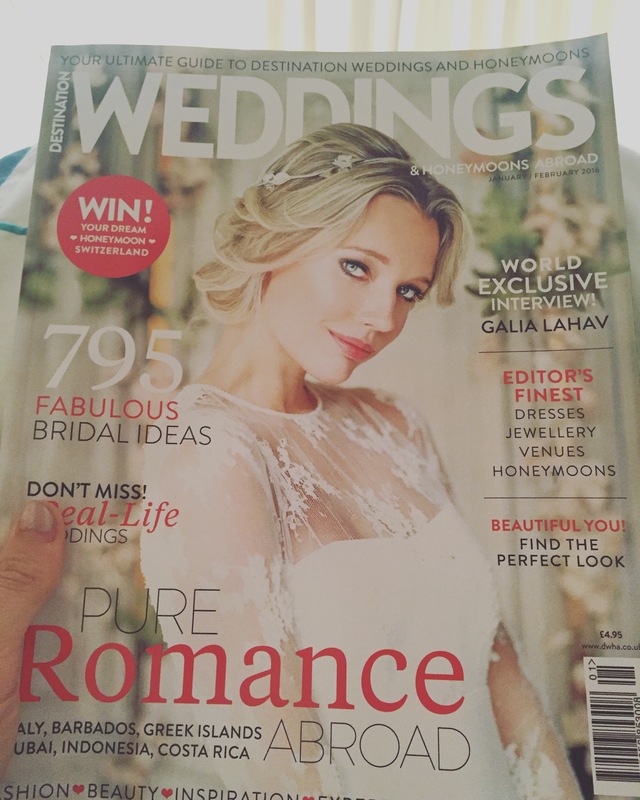 and a destination wedding magazine. So this morning I’m sat in bed flicking through the magazine and eating a very nutritious breakfast of chocolate and crisps, whilst Ed’s off at the gym.